More and more, I’m finding that pursuing academia means something different everyday. Tomorrow, it means giving up an A Fine Frenzy concert to oversee a Mark Twain Reading Marathon for Sigma Tau Delta. In August, it will mean moving away from the people I love to live on the other side of the country. For the next five years, it will mean earning one-fourth the starting salary of my engineering pals. In the future, it might mean putting off having children. It might mean never earning enough to buy my dream house. It might mean never having enough time for myself. Pursuing academia means missing out on a lot of fun. It means making sacrifices. Sometimes sacrifices so big you wonder if one day you’ll regret it. 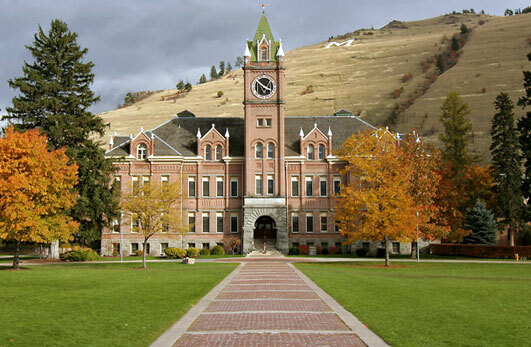 Missoula, Montana! I just finished the first day of this year’s National Conference on Undergraduate Research (NCUR) and am having a lovely time with my roomie (and bestie)… doing homework. Hey, we’re at a nerdfest research conference – what else would you expect? As I was in the middle of reading Byron’s Don Juan, a list of goals began to creep into my head. A list of crazy ridiculous over-reaching things I want to accomplish before graduation. But I suppose this isn’t new news to people who know me. I like setting big hard-to-reach goals. I make secret lists on Microsoft Word. I write them on colored post-its and stick them on my walls and closet doors. I constantly remind myself of the things I want so that I’ll get to work and make things happen. Some of them work out (i.e. my GRE score goals). And some of them don’t (i.e. becoming a Rhodes Scholar – darn that athletic requirement!). But what I really relish is that rush of knowing that there is this amazing thing out there that could be yours if only you worked a little harder. Lately, however, I’ve been floundering a little. It’s hard to motivate yourself when you’re technically “finished with everything.” Senioritis hits and you’re supposed to finally RELAX and enjoy your last quarter in college. But I am a sad workoholic, which I guess makes me a horrible “second semester senior.” I feel gross and lazy when I’m not doing anything. Which is why I’m so excited to finally be inspired again and have a new list of semi-realistic goals. In March, my dad told me not to let my last quarter go to waste and I’m going to make sure that it doesn’t. Watch out, UCLA! I’m going to go out with a bang (and not a whimper like T.S. Eliot suggests). This may seem like a very silly mundane conversation to remember and recount, but I think about this short exchange every so often because it is something that I want a professor of mine to say about me one day. A clever girl is smart and witty and dedicated and full of potential. A clever girl is going to go places. A clever girl is going to be amazing and wow people everywhere she goes. Some day, when my name comes up in conversation, I want a professor to say, “If anyone can make it, it’s Sophia.” Some day, I want to be a clever girl too. 2. This year, Forbes named UVA as one of the World’s Most Beautiful College Campuses. 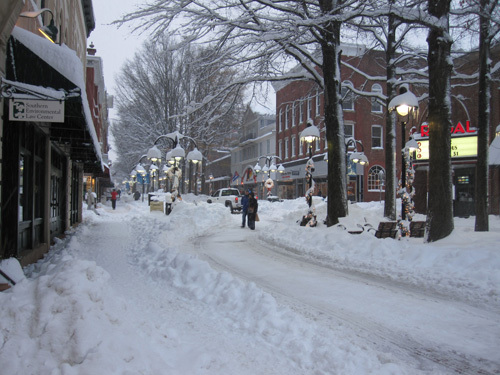 The town of Charlottesville has also been consistently ranked as one of the best places to live in the US. 3. Started by Thomas Jefferson (the only US President to found an institution of higher learning), UVA stands on land purchased by James Monroe. James Madison was also a Rector of the University. The three presidents’ homes are all located near the University. Definitely on my list of places to go see! I hear July 4th at Monticello is amazing. 4. Tina Fey (’92) and Katie Couric (’79) graduated from UVA! Georgia O’Keeffe and Edgar Allan Poe also attended UVA (although Poe had to drop out after his first year because he lost his tuition money to gambling). UVA was also home to William Faulkner who donated a huge portion of his writing/collection to the Alderman library upon his death. 5. Every year in March, Charlottesville hosts the Virginia Festival of the Book. 6. 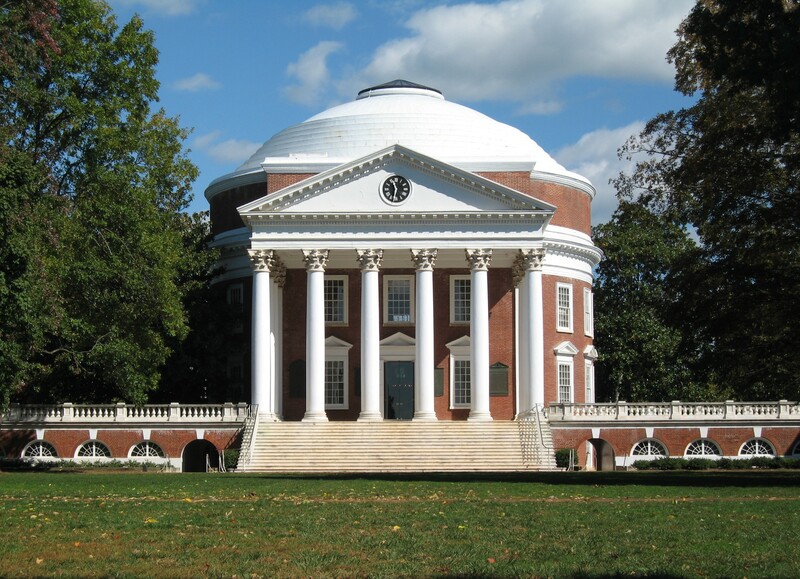 UVA is the only university to be designated as a World Heritage Site by UNESCO (together with Monticello). 7. Just as UVA likes to call itself the University, it also uses the definite article for various campus locations: the Grounds, the Lawn, the Rotunda, and the Range, in addition to the Corner on University Avenue. 8. The University is home to a number of secret societies, who leave signs of their existence around campus. 9. UVA has an Honor System where students “make a commitment not to lie, cheat, or steal.” Established with the purpose of creating a community of trust, the honor code allows faculty to give timed take-home exams and students to purchase books on campus by giving his or her word to pay. Very cool. Of course it doesn’t hurt that UVA has a top-ranked English PhD program. I can’t wait to become a Cavalier! I am uber uber excited about going to grad school at UVA and hope that you will continue to follow Sophialiteraria as I embark on this next chapter of my life. Thanks for all your support throughout this process, guys! One of the benefits of being a student researcher (surprisingly) is that you gain a lot of upper body strength from lugging armfuls of books to and from campus on a weekly basis. I officially started my senior thesis project last March, but have also had other concurrent research since January 2009. This translated into a lot of trips to Young Library and a lot of gasping and wheezing as I carried books back up the Hill where I lived. 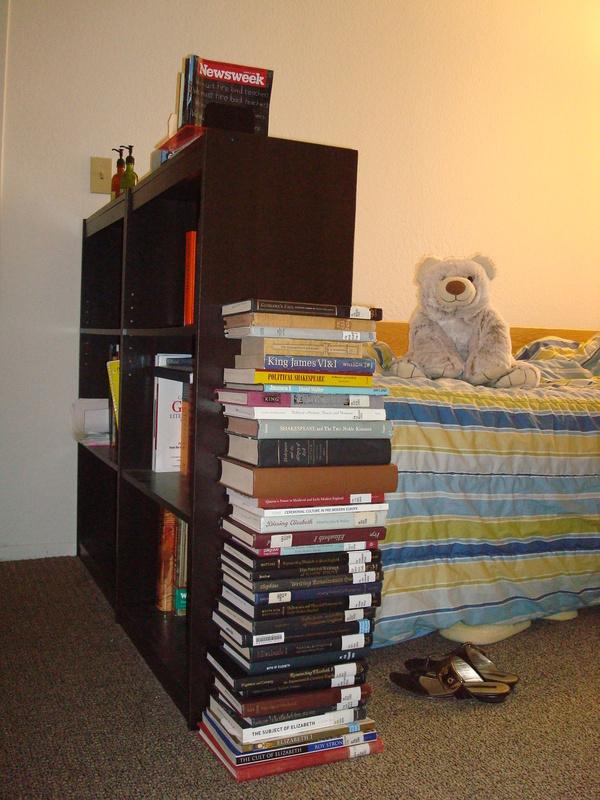 Over the past year, I’ve accrued almost an entire shelf’s worth of research material (apologies to anyone trying to check out a book on “Queen Elizabeth I,” “Henry VIII,” or “The Revenger’s Tragedy” among other related topics – I’m pretty sure I kidnapped that entire section). And this is true of most of the other Departmental Scholars that I’ve spoken to. If we put all of our texts together, we could probably build a mighty fortress of nerdiness awesomeness. Unfortunately, however, now that I’ve finally finished and turned in my thesis, it’s time to bid those books (and my dreams of building a book fort) farewell. 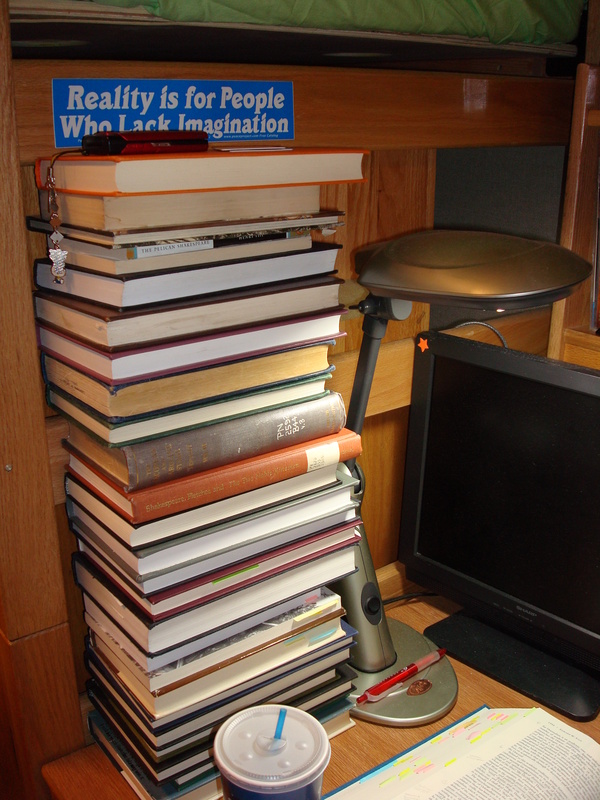 Thesis research with bookcase for comparison (roughly a dozen are missing because I've already started returning them). Texts from research on collaboration (picture taken last March).